Weave With Kids: Resources & Free Tutorial! Teaching kids a craft is a great way for them to practice fine motor skills, their ability to focus, and - most importantly - patience! Give them a break from their screens, and get them doing something tactile with their hands with our list of the best kid-friendly weaving products. Taking one last road trip before school starts? 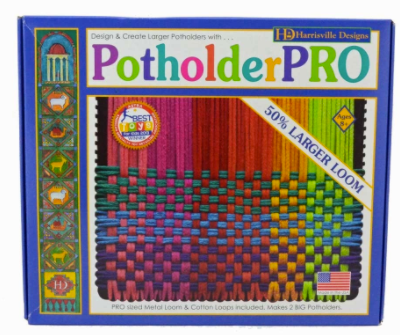 Grab a potholder loom and a five-pound bag of sock ends to keep small hands busy while you drive! Run out of rainy day activities? Small looms such as the Purl & Loop Wee Weaver and Schacht School Loom are perfect for learning the basics of weaving while making fun, small projects. Learn how to weave a toothy fairy necklace with our new free tutorial, which includes tips for helping kids in various age groups complete this project using the Wee Weaver! Click here to get the free tutorial PDF when you sign up for our newsletter (if you’re already a subscriber, simply enter your email address to confirm & claim your free download). We'd love to see your little one's creations - be sure to share photos using #thewoolery in your post!